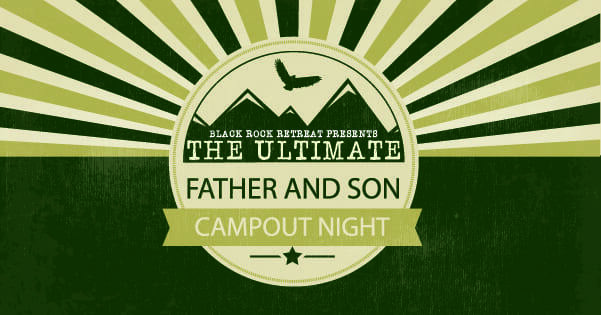 Put your phone down, close your laptop, grab your son and head out into the woods for some adventure at Black Rock Retreat’s Ultimate Father and Son Camp Out Night. Experience this memorable event, overcome challenges by working together, share an evening away from the television and marvel at the hand of the Creator all while laughing and connecting with your son and other dads. Bring your own tent, camp out with other Dads and Sons in our platform tents or really rough it by staying in one of our retreat rooms (limited space available here). Arrive between 5 and 6 pm on Friday June 9th, get set up and ready to rock and roll. You can expect some manly meals, physically and mentally challenging activities, a project to work on together as well as your choice of activities like swimming in the pool, laser tag, late night glow in the dark dodge-ball, fishing (bring your own gear and license if you have one) in the creek just to name a few.